Today is a super chill day, well I have decided to end the year like a lzy bun, sittin gin bed with a cup of hot coco and my laptop. so, I was looking back on last years winter outfits and here is second installment of my winter styles, do check out my Winter Outfits. 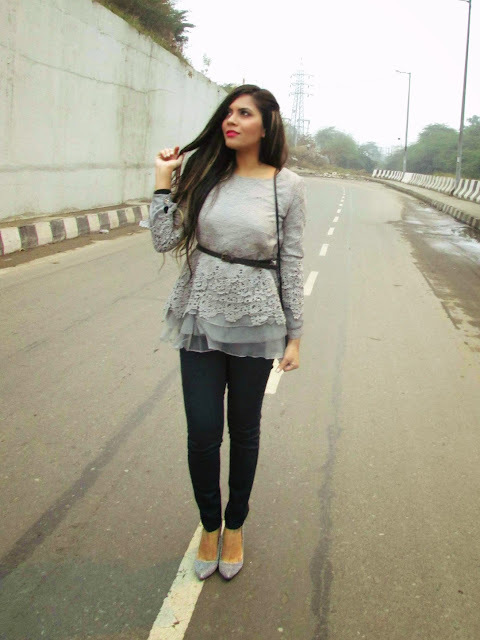 Do check out my first post, Winter outfits throwback and then lets get into todays post. Rocker Chic: To channelize the rebel i me, here is a rocker chic outfit. Pulled out my lace jumpsuit, wore spike bracelet and added a vampie lip. Jinxed and Happy : I love to wear coats with little skirts, this black peplum coat is one of my favorites of my entire collection. Fashion Chameleon : Vintage fashion is coming up in a big way these days, so here is my vinatge floral shirt. Love the shoulder paddind detail on it. One In Million : This is my go-to everyday outfit, a full sleeves lace top paired with leggings. You uys already know my obsession with lace. Grey : A color that we just cant go wrong with in winter is grey . I love this lace detail grey top. the laired peplum detail is super coo. I am o happy to see that most of the winter clothing from last year are still very mush in trend, I can mix and match it and style it in so many different ways. 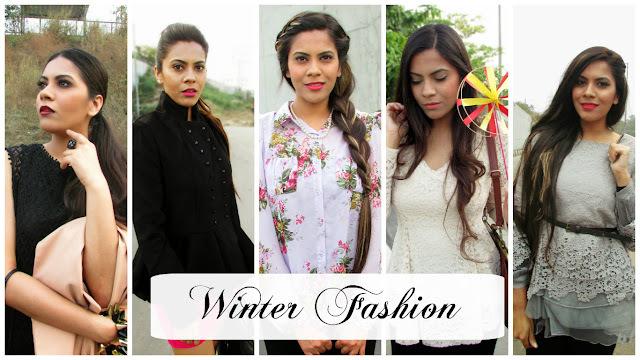 Hope you enjoyed the winter fashion trends throwback part two, few more winter outfit posts will be coming soon. 1st is my fav, so elegant! The first look is my favorite. You look lovely Pooja! Third is my favourite :) I like the first one too but without shoes ;) Just not in my style.